Retired Army Col. Bert Rice shares his experience of returning home from Vietnam as well as his recent visit with his sons to the country. 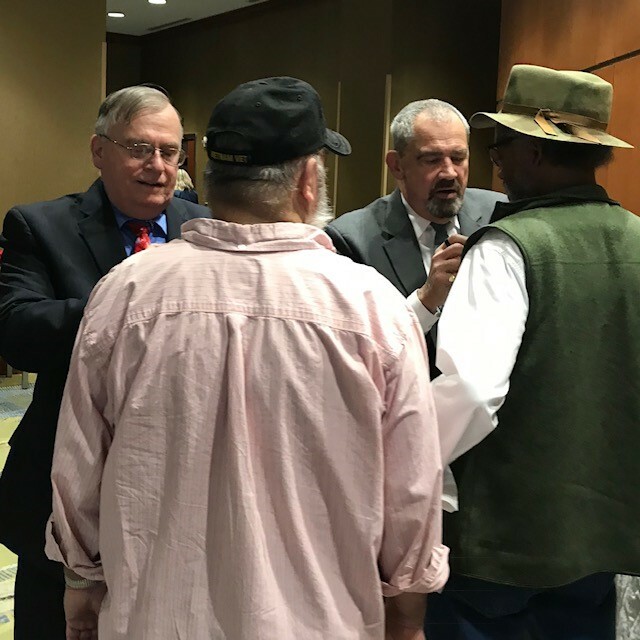 There were many milestones mentioned at the Welcome Home Vietnam Veterans Day Celebration held March 29 at the Hilton Baltimore BWI Hotel in Linthicum. It honors the proclamation by Gov. Larry Hogan that 2019 is the Year of the Veteran for Maryland. It was the fifth year for the event honoring the state’s annual commemoration, which was the first bill the newly elected Hogan would sign into law in 2015. But most importantly for the guests of honor, it was 46 years from the date the last United States troops left South Vietnam, and these Vietnam veterans were there to be welcomed home. More than 500 people attended the three-hour event, including around 220 Vietnam War veterans. It began with a rousing welcome into the venue by members of local chapters of the Kappa Epsilon Psi Military Sorority and then pinning of the Vietnam War 50th Anniversary Commemoration pin by active-duty military and veterans, including Maryland Department of Veterans Affairs Secretary George W. Owings III and Deputy Secretary Robert Finn. The event offered an opportunity for the guests of honor to reconnect and to visit 13 different groups and agencies offering resources aimed at assisting Vietnam veterans. The Maryland Public Television Salutes Vietnam Veterans Traveling Exhibit also was on site, and several of the 16 men and women featured in the exhibit were there to participate in the celebration. The 90 minutes leading up to the evening’s program also included food, slideshows of veterans, those who are still with us and those who have passed on, and plenty of time to mingle with fellow veterans. The program included musical performances by the U.S. Naval Academy Band and Voices of Vets, Inc., an Honor Salute led by Fort George G. Meade Command Sgt. Maj. Edward Elliott and a number of speakers, including Owings, a Marines Corps veteran who served in Vietnam; retired Army Command Sgt. Maj. Rodwell Forbes, who served as the master of ceremonies; retired Army Col. Bert Rice, who spoke of his service in Vietnam as well as his recent visit to the country; and keynote speaker Dr. Scott Shreve, National Director of Hospice and Palliative Care for Veterans Affairs. The speakers touched on the message of volunteerism to serve veterans in their time of need and that no veteran should ever be forgotten. 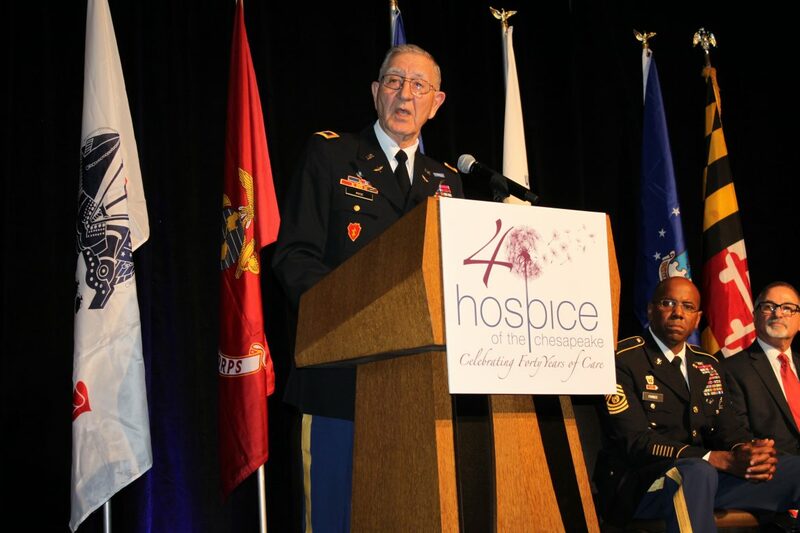 This message of service was amplified in the debut of “Not On Our Watch,” a video featuring veteran and active duty volunteers who perform Honor Salutes to hospice patients and other veterans facing end of life. “After five years of welcoming you home and 40 years of caring for those living with illness and loss, we have learned so much,” Hospice of the Chesapeake President and CEO Ben Marcantonio said. “But most importantly, we are better prepared today to respond to the needs of Vietnam veterans and all veterans in our state than ever before. Headquartered in Pasadena, Maryland, the nonprofit is a Commemorative Partner in the United States of America Vietnam War Commemoration as well as a 5-Star Partner in the We Honor Veterans program, a national hospice initiative honoring the men and women from all branches of the military who have served our country. 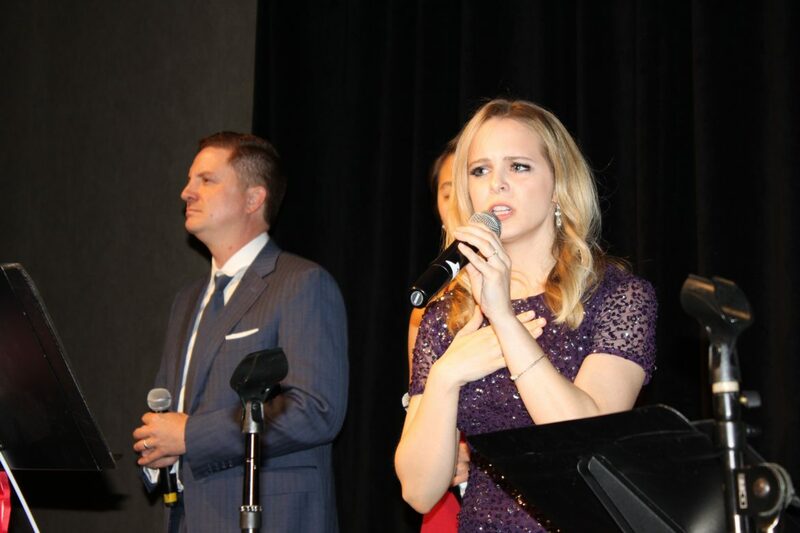 Kassie Sandacz with Voices of Vets, Inc., sings “God Bless America” at the end of the program. Retired Army Command Sgt. 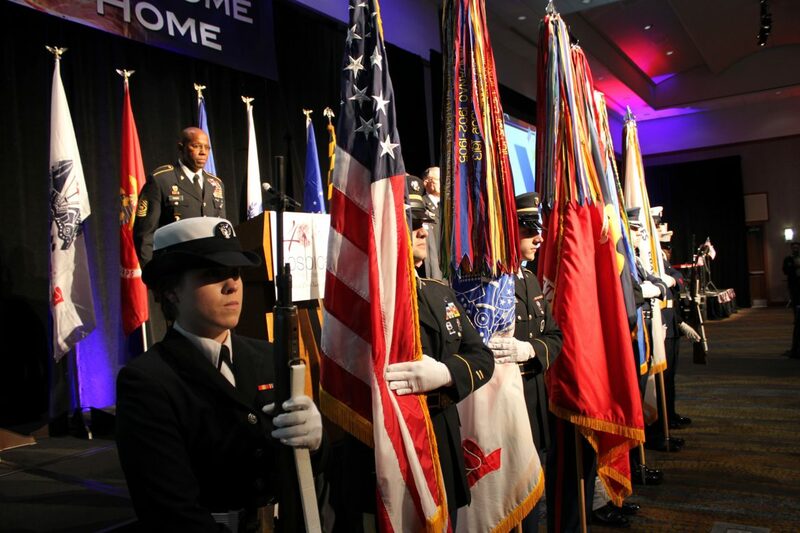 Maj. Rodwell Forbes stands behind members of the National Security Agency Joint Color Guard while the Star-Spangled Banner is played by the U.S. Naval Academy Band. Air Force Tech. Sgt. 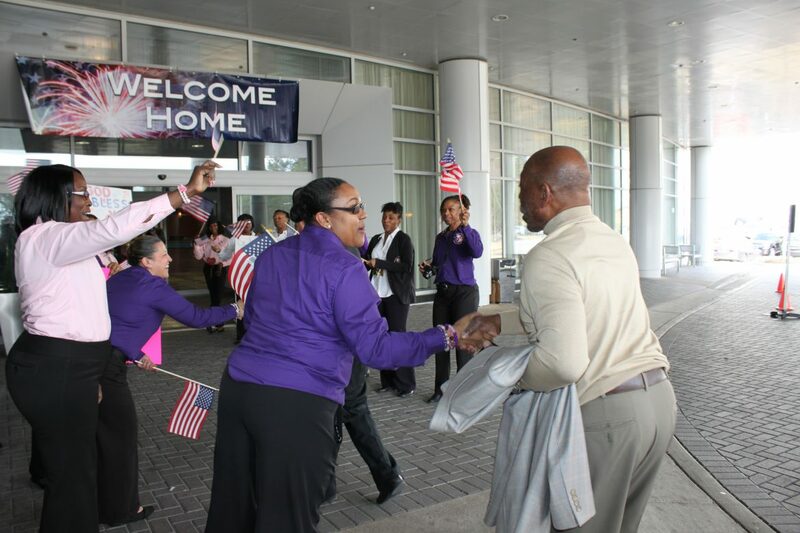 Akesha Lowry shakes the hand of a Vietnam veteran as he arrives for the Welcome Home Vietnam Veterans Day Celebration and is welcomed by other members of the Kappa Epsilon Psi Military Sorority.